Well, I certainly have been quite the disappearing act lately! Hello! 🙂 I figured it was finally time to peek my blogging head out from the rock I’ve been hiding under for the past few months and give you the inside scoop on what I’ve been up to! All of that being said, with all of the endless shoots and events of these past few months, I have fallen sorely behind on updating this little blog here, and re-telling the stories of my gorgeous, four-legged clients and their photo adventures. So, I am on a mission to do my darndest to get lots of recent session features up on the blog for you to enjoy! I cant think of a better way to kickstart lots of new blog posts than with the impossibly adorable four-legged, wiggly wonder — Minnie the Beagle! Minnie’s session took place back in November (I know, I know! I wasn’t kidding when I said I was behind on blogging!) On the day of our session, we were blessed with the most gorgeous yellow, autumn sunlight to romp and play in! Minnie was an absolute star for her session – oh, she didn’t hold back! She pulled out all her best looks, including the tragic ‘give me treats!’ face. Minnie’s Mom, Kim, contacted me for once in a lifetime portraits of her sweet girl shortly after Minnie was diagnosed with congestive heart failure. The moment that I met Minnie, I knew exactly why these portraits were going to be so important to her Mom. Minnie is has got the most incredible soul, the kindest eyes – and above all else – one of the most intense and loving connections with her human that I’ve ever seen. Her spirit was unprecedented, her wiggly little body was bursting with the purest kind of joy as she bounced about through our session together. And how ‘bout Minnie’s array of endless expressions? … It was all I could do not to crack up while shooting. 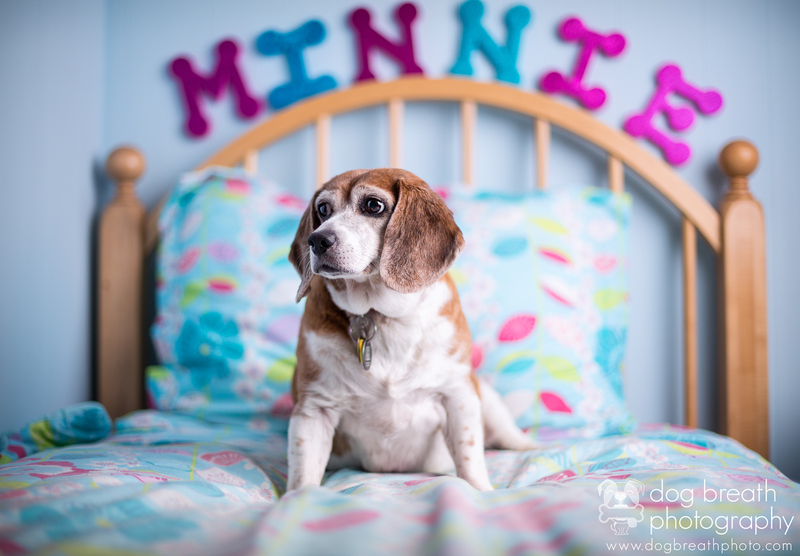 When Minnie’s Mom, Kim, mentioned she’d like to capture some images of Minnie in her ‘room’ at home, I excitedly obliged – thinking this just might be the coolest dog Mom ever! Minnie has her own room!? Never did I realize that Minnie’s room was going to be so completely fabulous! She’s got her own bed for snoozing, lots of pillows for relaxing, collections of treats on the floor, Beagle themed art all over the walls, and even her name written in sparkles! Yes, this truly is a rags to riches story. From a scared, broken shelter dog – to an endlessly happy, limitlessly loved, joyful little nugget who likes to nap with her door closed! ha! Minnie was so proud to show off her supercool digs! When I delivered Minnie’s images (including her gigantic 30×40 canvas!) to Kim, we both spent a few moments in happy tears, hugging in her kitchen – both knowing that these images are one day going to be the closest connection that Kim will have to her sweet, joyful little girl. I hope they serve to preserve her smile, warmth and spirit for endless years to come. Thank you for choosing me to be the one to capture your perfect, sunshiney little girl, Kim! I couldn’t have asked for more perfection inside one wiggly, fuzzy little body! Beautiful shots….loved the story….and cried with both of you at the end. I wish Minnie many, many more naps with the door closed! Love it Kaylee, what a beautiful session! Every shot is a work of art, as per usual. Which image did Kim choose for her canvas, I’m dying to know? It must have been such a hard choice! What can I say. She is the sweetest looking ole girl, with her frosting. Love the sole within and it comes through in your shots. I to am crying thinking about my Amber who had congestive heart failure and Mr Max who at almost 16 yrs old is slowing down, and will be missed when his time comes. You are one talented lady! Love you & your subjects. WOW! You captured the many faces of Minnie…and even got a cutie patootie bootie shot! Kim is the best mom in the universe! Minnie’s room is beyond livin’ large. Lots of love to Minnie and her family. Thanks for this amazing tribute! Another awesome blog from our favorite photographer and storyteller. It wasn’t until we ran across Dog Breath Photography that we experienced such magical words from the heart, in concert with such incredible visual images. Not sure which has more impact… but the combination is impactful and beautiful. Forever grateful for all you do, Kaylee. Kind wishes to Minnie and her family… her eyes tell everything! Such a beautiful, loving girl.